Veteran athletic coach Yogananda Wijesundera was felicitated for his 50 years of untiring service for Sri Lankan athletics during a ceremony participated by his contemporary coaches, athletes and sports association officials at the Olympic House yesterday. The event was organized as a part of Save the Sport organization’s annual felicitation program for veterans who have contributed immensely for the betterment of Lankan sports. 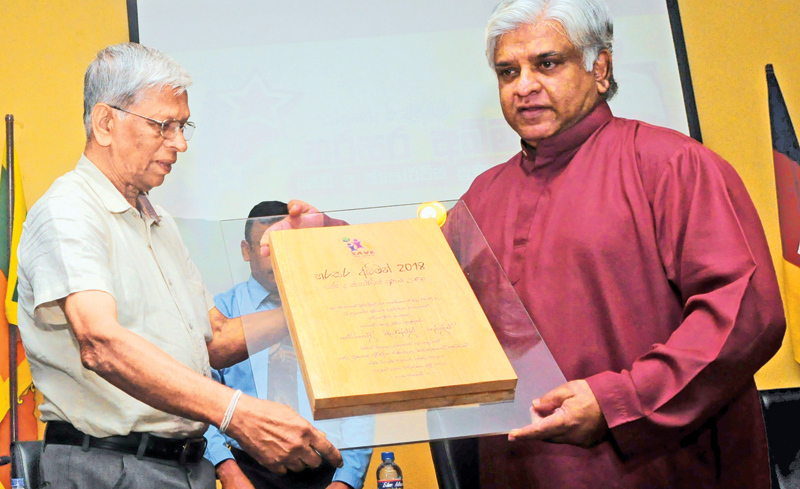 Sri Lanka’s 1996 cricket World Cup winning team captain and Petroleum Resources Development Minister Arjuna Ranatunga was the chief guest at the occasion. It was a great inspiration to athletes as 73-year-old Yoga who is feeble delivered a moral boosting speech after receiving the Save the Sports felicitation plaque from Arjuna Ranatunga. Yoga revealed that his knowledge in other fields has immensely helped him to become a great coach for over five decades. “A coach must be a knowledgeable person. Not just on sports, he must be aware on fields such as politics, geography and history. Discipline and personality are paramount. It takes a long time to earn fame, but ill-fame will come in a flash. Sports have become an art, but it can differ according to the coaches’ viewpoint,” Yoga explained. Yoga also went on to say that two kinds of people are engaged in sports at present, those who work for the betterment of it and those who are depending on it. The latter he mentioned were people who have ulterior motives to earn money tarnishing the true spirit of sports. He thanked Ranatunga for taking the initiative to felicitate sporting greats at a time the Sports Ministry was failing to do this national task. Ranatunga recalled how the advices and opinions Yoga revealed during TV programs helped him to mould his cricket career as well as his personal life. “Our country is badly in need of coaches of Yoga’s calibre at present. Unfortunately we don’t see such coaches coming up. Sports veterans and former champions are getting distanced from sports day by day with no proper mechanisms. Sri Lanka’s cricket success was mainly based on former Minister Gamini Dissanayake’s short, medium and long term plans. But today not only cricket but also other sports are facing a retreat. Temporary solutions will not solve the problems, we all have to join hands to take Lankan sports on the right track,” Ranatunga said.